“Using diamond dust and laser light to control atomic spin, Ashok Ajoy PhD ’16 pursues alternatives to costly conventional imaging technologies. Listening to Ashok Ajoy PhD ’16 talk about his work, it’s easy to forget he’s a physicist. “I make spins dance together, go up or down, interact, in a kind of spin choreography,” he says. Ajoy unleashes his creativity not on human bodies but on elementary particles, manipulating quantum behavior, and specifically, spin — the property of angular momentum intrinsic to such entities as atomic nuclei. After doctoral research at MIT generating insights on spin and novel methods for maneuvering quantum mechanical objects, Ajoy is now pioneering technologies with the potential to transform the fields of imaging and chemical analysis. Using diamond dust, laser light, and water, Ajoy and his colleagues at the University of California at Berkeley are pursuing alternatives to the multi-million dollar, room-size machines in current use. “Our vision is to achieve conventional magnetic resonance imaging at a fraction of the cost and to revolutionize industries that rely on nuclear magnetic resonance to study molecules, such as pharmaceutical companies,” he says. These emerging technologies reflect Ajoy’s lifelong passion not just for understanding how things work, but for crafting things that work better. Growing up in Bangalore, Ajoy says he “learned that building something and making a mess is fun.” His dad, “a gizmo freak,” found ways to use parts intended for other applications, like building a revolving table from a washing machine rotor. “He was really creative, and while I didn’t acquire his genes, he really inspired me,” says Ajoy. In college, Ajoy secured the key to the physics lab, where he “hung out the entire night, trying to make signal generators and other basic instrumentation on the cheap.” It was here that his fascination for quantum engineering crystallized. He wanted to build his own version of an nuclear magnetic resonance (NMR) machine, a spectroscopy instrument that could function without the expensive magnet. Ajoy’s ambition was to leapfrog technology launched at MIT after World War II. “Using equipment lying around in the radar lab, scientists saw that by shining radiofrequency — electromagnetic radiation — on water, they could produce a signal from deep inside the nucleus of hydrogen atoms,” says Ajoy. That was the birth of NMR and magnetic resonance imaging (MRI). This signal, generated when nuclei in hydrogen atoms align in the presence of a magnetic field (a manifestation of quantum mechanical spin) sparked new imaging technology. With MRI and NMR, magnets generate an imbalance in spin orientation of hydrogen nuclei in water molecules, and machines read that imbalance. As this technology has matured over decades, the size and strength of the magnets has grown, with some NMR machines used for molecular analysis occupying entire building floors. 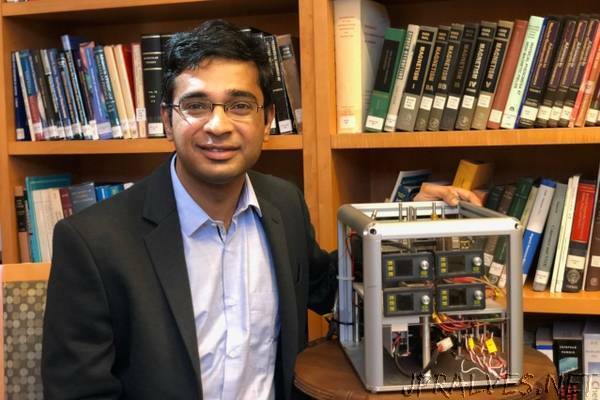 It was not until Ajoy arrived at MIT for doctoral work in nuclear science and engineering that he was able to delve directly into the spin physics that pointed toward a magnet-free approach to imaging. He found research freedom and support in the lab of Paola Cappellaro, the Esther and Harold Edgerton Associate Professor of Nuclear Science and Engineering. Discerning molecular structure molecule is essential to making new compounds, including drugs. While X-ray crystallography and NMR can accomplish this feat, these techniques are limited since not all molecules can be crystallized for X-ray imaging and NMR requires large samples of a substance to image. When Ajoy finally got his chance to build a machine to test his theories, he says: “We were short on resources, so we planned it down to the last mirror,” he says. His experimental findings, demonstrating a method for extremely high resolution, NV-center nanoscale imaging, proved nonetheless groundbreaking, and were published in Proceedings of the National Academy of Sciences. Ajoy’s doctoral work earned him the department’s 2017 Del Favero Thesis Prize. It also drew the attention of Alexander Pines, Glenn T. Seaborg Professor of Chemistry at Berkeley, who invited Ajoy to lead a 20-person team to exploit diamond spins for new applications. His group is rapidly advancing into new territory, including crushing pink diamonds into dust to increase the surface area of a spin-based imaging device, so that even a tiny amount of light can align the spins. The next goal is to flow water through a device containing optically polarized diamond dust, creating polarized liquid. This vision is swiftly moving beyond the realm of science fiction. Over the course of four months, Ajoy’s team constructed a prototype imaging device a bit bigger than an iPhone for $3,000. If the group can polarize liquid with it, they will have an inexpensive, portable imaging instrument perfect for wide-ranging medical applications.